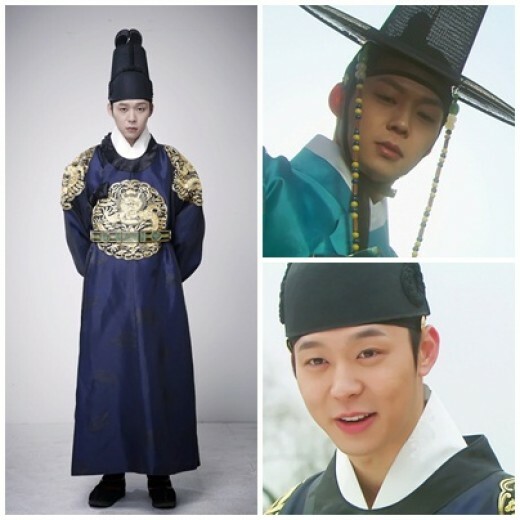 Actual Model for Rooftop Prince’s Yuchun is Joseon Gyeongjong – Tragic Ending? The various evidences emerged that show that the actual model for the character of Lee Gak in SBS drama series “Rooftop Prince” is the 20th king of Joseon Dynasty, Gyeongjong, has attracted attention. According to historical records, Gyeongjong who was born by Sukjong and Jang Hui Bin was named Lee Yun. He was born in 1688, and ascended the throne on 1720. During his reign, the political struggle between Noron and the Soron factions reached the climax. Legend has it that he demised in 1724 after eating the crab sauce and unripe persimmon prepared secretly by half-brother Yeongjo who used to be Prince Yeoning. And, his first wife, the Crown Princess, passed away 2 years before he ascended the throne, and was given posthumous title of Queen Danui. A lot of netizens began to compare official and unofficial history of Gyeongjong with events around Crown Prince Lee Gak in “Rooftop Prince. Firstly, the name of Lee Gak is taken from the posthumous title of “Gakgong the Great” given by Qing Dynasty to Gyeongjong. In the first episode, scene of Crown Prince acts on behalf of sick Sukjong (Kim Yoo Suk) is shown. There is also tense political confrontation between Noron and the Soron factions, and mention about the premature death of Crown Prince who married when young. Especially, the secret of mysterious death of Crown Princes (Jung Yoo Mi) that debuts on episode 1 is surrounding the dried persimmons, and in episode 7 and 8, Crown Prince who ate crab sauce suffers difficulty in breathing, all these pointed to conclusive evidences. Also in the part of episode 8, Park Ha (Han Ji Min) sheds tears after reading the Annals of the Joseon Dynasty, as she gets to learn the poor deeds of Gyeongjong in history, and knows what would happen to the future of Lee Gak. This is even more convincing. And in a part of episode 6, Crown Prince, Park Ha and the henchmen trio reveal their ages respectively. When calculating the age of Crown Prince in current sense, giving the disclosure of 24 years old, he would be born in 1988, coincidentally it’s exactly the age of Gyeongjong 300 years ago. What’s more interesting is that the age of Park Yoochun who was born in 1986, 26 years old is also similar to the age of Lee Gak. Netizens who learned of these commented, “So ‘Rooftop Prince’ is not just fictional, but has great connection to the secret of history, really amazing,” “Screenwriter is really attentive. Exactly because of this, that is why ‘Rooftop Prince’ is so interesting,” “Can the half brother of Gyeongjong, Prince Yeoning, is the current cousin Tae Mu?” “I don’t like tragic ending” and so on. Because of this, “Rooftop Prince” which is about to broadcast the grand final is even more worthwhile to watch knowing the similarities between Crown Prince Lee Gak and Josen Dynasty King Gyeongjong.